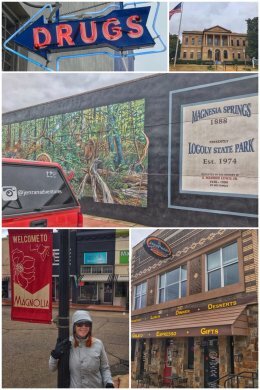 We crossed over the Mississippi River and landed in the nice little town of Lake Village, Arkansas — within the Mississippi Alluvial Plain (Delta). The town offers a great Arkansas Welcome Center, as well as access to numerous trails, scenic drives, and historic sites. Springs seem to dominate The Natural State — the 17th state we have visited on this adventure — with many towns and cities named for local springs, such as: Hot Springs, Siloam Springs, Heber Springs, Eureka Springs, Cave Springs, Elm Springs, Mineral Springs, Mammoth Spring, Sulphur Springs, Valley Springs, Gum Springs, Ravenden Springs, Black Springs, Whelen Springs. A natural spring occurs when water pressure causes a natural flow of water from an underground aquifer to the Earth’s surface… and there are 16 aquifers in the state. Lake Village is filled with wild pecan trees, which are native to the state. 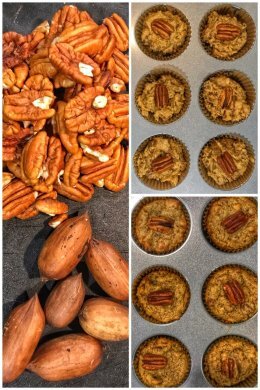 The pecans were highly valued by Native Americans, who traded and consumed them — while Spanish explorers thought they were another sort of walnut and called them nueces (“fruit of the walnut”). Pecans are a great source of protein, and somewhat easier to crack than walnuts. In terms of an agricultural product, an estimated 2.6 million pecans are harvested from orchards all around the state. 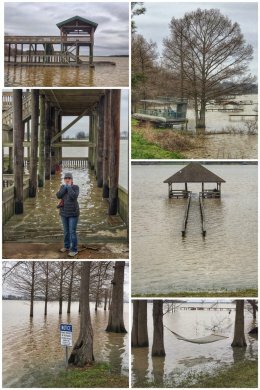 Sadly, just like in Mississippi, we saw lots of flooded areas as we explored southeast Arkansas. Lake Village is located on the banks of Lake Chicot, which formed in the 1350s and is the state’s largest natural lake — and the largest oxbow lake in North America. (An oxbow lake occurs when a wide meander from the main river — in this case the Mississippi River — is cut off, creating a free-standing body of water.) Shaped like the letter “C,” the lake is more than 25 miles long and about a mile wide and the name comes from the French word meaning stumpy, for the knees of the Cypress trees that grow along the banks. Arkansas has a state park at the lake, but it was completely closed because of the flooding. Speaking of flooding, Arkansas is also home to the longest continuous levee in the world, following along the south bank of the Arkansas River and the west bank of the Mississippi River, and totaling 640 miles. The levee was built in the 1930s by the U.S. Corps of Engineers after the Great Flood of 1927 killed 300 people, flooding 250,000 square miles, including about half of the entire state. While in the area, we visited Arkansas City, once one of the most important ports on the Mississippi River — until the Great Flood of 1927 changed the course of the river. We parked in the Delta Heritage Trail State Park and decided to hike some of the trail, which follows the former rail corridor (donated by the Union Pacific Railroad) from Arkansas City to Lexa. 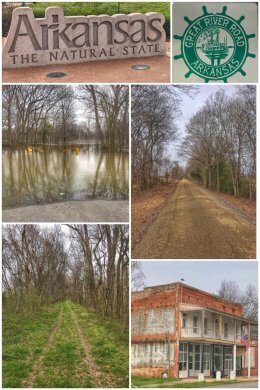 The trail follows the levee up to the town of Rohwer before transitioning to the old Missouri Pacific’s Delta Eagle railroad right-of-way… so we also drove up to Rohwer to hike some of the true rail-trail. We also went there to visit the Rohwer Internment Camp, site of one of two relocation centers that were built in Arkansas (out of 10 built nationwide) for housing Japanese-Americans that the government incarcerated during World War II. All that remains of the 500-acre camp is the cemetery, a National Historic Landmark, and several informational signs that provide details about the camp. From Lake Village, we headed west to Magnolia, located in the West Gulf Coastal Plain (an area covered by the waters of the Gulf of Mexico until about 50 million years ago) — and home to extensive areas of loblolly-shortleaf pine forests. The downtown has a lovely square, which we walked several times — including once to visit a local coffee shop, JavaPrimo, to have a rare afternoon coffee to help warm us up during a cold snap. The city’s history is a mix of regional cotten center and the site of a major oil field discovery (that was the top producer of oil during World War II). The city is also home to the Mulekickers of Southern Arkansas University, as well as to the World’s Largest Charcoal Grill and the World Championship Steak Cookoff. 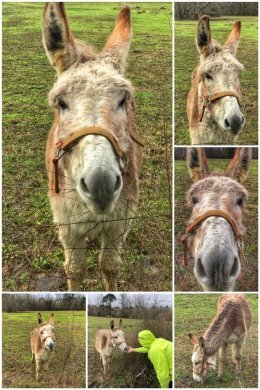 While in Magnolia, we stayed a small and quiet RV park (Magnolia RV Park) in a rural section of town, which led us to a wonderful discovery during one of our many walks we take during breaks from work and school… to Wooly Donkey. (If you are unaware from previous posts, we have had our hearts permanently altered by the love for burros and donkeys — and they serve as a kind of spirit animal on this adventure, always showing up when we need a little extra boost.) These gentle and intelligent creatures are fiercely protective of their territory and are often used by ranchers as livestock guardians for sheep, goats, and calves. While in the area, we also visited two state parks. We have been loving exploring Arkansas parks, which have excellent facilities and have had no admission fees. Logoly State Park is the state’s first environmental education park, providing 368 wooded acres (some old growth forest) as a living laboratory for students and visitors. The park also contains the remnants of Magnolia Springs, a tourist attraction in the late 1800s and early 1900s that brought people from all over seeking a cure to health problems ranging from ulcers to infertility — believing that the mineral in the waters had medicinal value. As culture changed and farming and homesteads increased (reducing the flow of the springs), the area was mostly forgotten until the Boy Scouts established a summer camp here from 1940 to 1967. In 1973, the state acquired the land and in 1978, the state park opened. 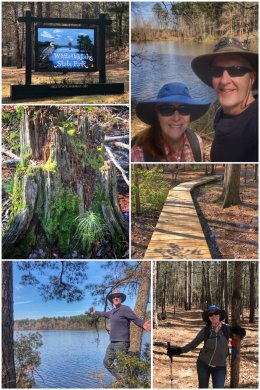 We enjoyed hiking the Springs Branch Trail (a 2-mile loop), combined with the .5-mile Magnolia Springs Trail (which also provides access to Salt Springs). The park also offers tent camping, bathrooms with showers, and picnic facilities with a playground. The visitor center offers tons of interactive experiences for children. We also decided to explore White Oak Lake State Park, located a few miles from Bluff City — and about 40 miles north of Magnolia. 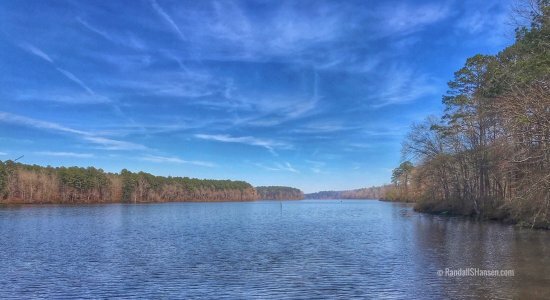 This 725-acre park offers fishing, boating, picnicking, camping, and hiking opportunities. We were interested in hiking one or more of the four trails in the park — which wind their way through a variety of environments, from marshlands to beechtree-covered ridges. (White Oaks and hickory trees also grow in the park.) 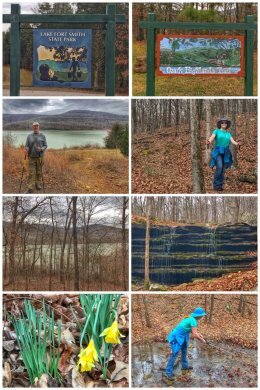 We chose to hike the Coastal Plain Trail (which includes some of the Beech Ridge Trail), mainly because we liked the 3-mile length of the trail, but also because we wanted a trail that went both through forest and next to the lake. The Spring Branch Trail is the shortest — a .33-mile loop from the picnic area. The Fern Hollow Hike/Bike Trail is the longest, at 10 miles. We ended the day with a 7-mile trip down the road to the Poison Springs Battlefield State Park, which commemorates the Battle of Poison Spring during the Civil War. The park offers a beautiful and short (.3-mile loop) trail down to the spring and back up. We considered also visiting Crater of Diamonds State Park, located about 70 miles north of Magnolia… because it is a park for rockhounds, where you are actually encouraged to dig for diamonds and other semi-precious stones (such as agate, quartz, and amethyst) in a 37-acre volcanic field. You can bring your own tools or rent them at the visitor center. The park itself is a little larger than 900 acres and includes trails, camping sites (with full hookups), and picnic facilities… We didn’t go because the weather was mostly rainy while we were in the area and neither of us actually wanted to dig around in the mud for hours. Maybe next time! 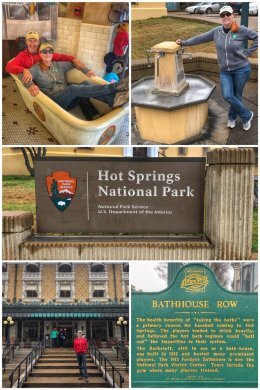 From Magnolia, we sprang northward to Hot Springs, located in the Ouachita Mountains region of the state… and the hometown of former President Bill Clinton, as well as the location of our 32nd national park on this journey: Hot Springs National Park. Hot Springs has been home to baseball spring training (including visits from Babe Ruth), illegal gambling, speakeasies, and gangsters such as Al Capone. It also has a long tradition of horse racing at Oaklawn Park, and is home to the Army and Navy Hospital. It is also home to a lot of traffic and congestion; in the main Historic District, parking is limited, but a free parking garage is located just a block west of Bathhouse Row. We arrived to more gloomy, rainy, and foggy weather conditions, but still had a blast exploring this fascinating city — named for the hot mineral water (143 degrees F) that rises from an estimated depth of around 8,000 feet — and which had fallen as rain some 4,000 years ago. Many believed the mineral water in the springs contained medicinal value that could help or cure a wide variety of ailments. The first known users were several Native American tribes, followed by European explorers, and then businesspeople who saw the opportunity to make money from spa treatments. The U.S. government amazingly decided very early, in 1832, to protect the springs by declaring a large area around Hot Springs as a federal reserve. What followed was the development of a town featuring at first primitive bathhouses situated directly over the hot springs, then larger but modest buildings (many of which burned in a major fire), followed by very glamorous bathhouses of marble and stained glass — in what is now known as Bathhouse Row. All the buildings were independently owned — and competed with one another for customers… using all sorts of interesting sales and marketing tactics (which greatly appealed to Ran). The Park Service owns all the old bathhouse buildings on east side of Central Street, the main drag in Hot Springs (and which sits directly on top of Hot Springs Creek). Two old bathhouses (the Buckstaff and Quapaw) still operate as bathhouses under NPS regulations, while another is now a pub, another a park gift store, another an art gallery, while two others are currently under renovation… with the most opulent former bathhouse serving as the park’s visitor center. 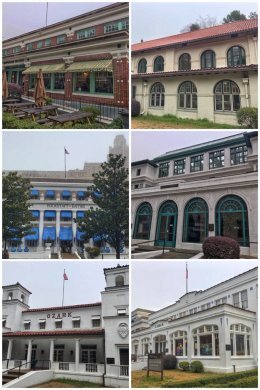 Each of the buildings had a different architectural style (including neoclassical, renaissance-revival, Spanish, and Italian styles) and attracted different target markets… with names such as Buckstaff, Fordyce, Hale, Lamar, Maurice, Ozark, Quapaw, and Superior. 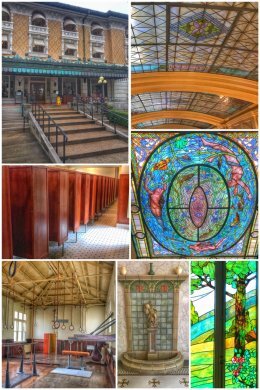 With its marble floors, grand piano, wood-lined changing rooms, and stained glass, this opulent bathhouse catered to the wealthy. You can wander around the building and see history preserved in 23 furnished rooms, including: the steam rooms, massage areas, state rooms, gymnasium, and parlors (one for each gender). 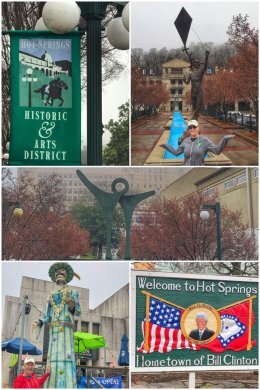 Of course, Hot Springs National Park also protects more than the gorgeous old buildings… it also protects the mountainous land around the hot springs; the park actually straddles a great horseshoe-shaped ridge formed by Sugarleaf, Music Mountain, Hot Springs, West, and North mountains. The park includes all sorts of interconnecting hiking trails on Hot Springs and North Mountains to the east, and West Mountains to the west. 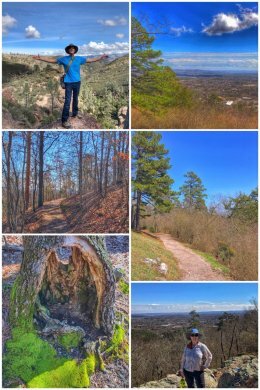 We spent our time hiking around the Hot Springs Mountain Trail (using a small parking spot at the Pavillion near the Hot Springs Mountain Tower as our starting point), up along the Upper Dogwood Trail, and looping back to our starting point. 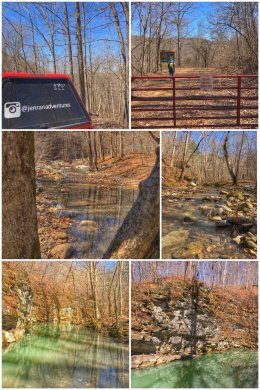 We also hiked the Goat Rock Trail… all of which added up to more than 5 miles of hiking around both mountains. 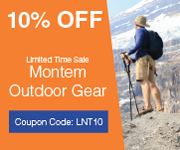 Most of the individual trails are fairly short, but one can simply keep connecting to another trail to keep on hiking and exploring. For those not so much into hiking, both the east and west mountain areas offer scenic drives, with numerous places to park. 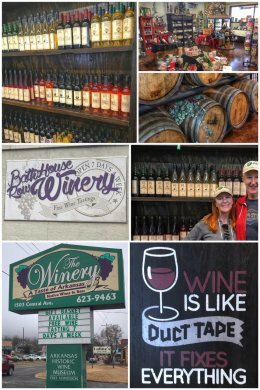 We had not really planned any wine-tasting while in Hot Springs, but one cool and gloomy afternoon as we were walking in town toward a local coffee shop, we stumbled upon Bath House Row Winery — and decided that fate had intervened. Goodbye coffee, hello wine. The wines were mostly sweet, but we learned some interesting things, such as that the muscadine grape grows wild in the state. We left with a bottle of Dogwood Moscato and Old Mill Muscadine. We also had to buy a bottle of Muscadine Hot Sauce (which was amazing when we used it as a glaze on barbecued pork chops). We later visited its sister winery, The Winery of Hot Springs, which also includes an informative Arkansas wine museum. Interestingly, while the grapes and varietals were similar to Bath House Row, the wines were different. We left with a bottle of Hot Springs Mountain Red and Lake Hamilton Sunset. 2,240-acre Lake Catherine State Park in the Ouachita Mountains, established in 1935, and about 2 miles southeast of Hot Springs. operated from 1933 to 1942 — and so many of the trails, roads, and buildings they created are still in use today in all these parks. Lake Catherine is actually a reservoir (like many of the lakes we have been visiting lately), but it still offers much for those who like fishing and water sports. The park includes a visitor center, campgrounds, picnic areas, bathrooms, and several hiking trails. We hiked the 2.0 mile Fall Branch Trail loop, which takes you to Falls Creek Falls. The other two trails are both strenuous hikes, including the the 3.5-mile Horseshoe Mountain Trail loop and Dam Mountain Trail (a 4.5 -mile loop, but accessed at the Falls, which will add additional mileage to the hike). From Hot Springs, we traveled to Alma in western Arkansas, just outside Fort Smith, in the Arkansas River Valley region — a 40-mile wide area carved by the White River long ago that divides the Ouachita and Ozark Mountains. 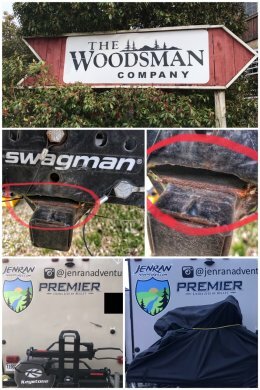 During the drive, we had a panicky moment when we realized the Swagman bike carrier that is under 2 years old was breaking apart at a key seam, and the bikes were at risk of falling off onto the road. Jen made some quick phone calls and we happily found Robert, who works at The Woodsman Company; he recommended a Yakima Dr. Tray bike carrier — and later installed it for us after searching the store for the last one in stock. Happily, our bikes are once again safe! Happily, located right next to The Woodsman Company location is a natural foods store we wanted to visit. If you want some organic choices (which are pretty limited in Arkansas), go to Olde Fashioned Foods, Inc., on Phoenix Avenue. We happily left the store with packages of grass-fed beef, Simple Mills crackers, Kettle Brand Organic chips, and Green Valley Creamery Organic Cream Cheese. Score! Our nature fix while in the area was visiting Lake Fort Smith State Park, located about 35 miles northeast of Fort Smith (and only about 20 miles from our campground). The park has an interesting history — first opening as a city park, then as a state park in 1973, and then completely relocated and reopened in its current location in 2008, following the enlarging of Lake Fort Smith, a 1,400-acre reservoir, when they combined the original Lake Fort Smith with Lake Shepherd Springs (which was originally built two miles upstream). The park is quite lovely, with a beautiful visitors center, swimming pool, marina, group lodges, cabins, campgrounds with full hookups, picnic area, playground, and trails. 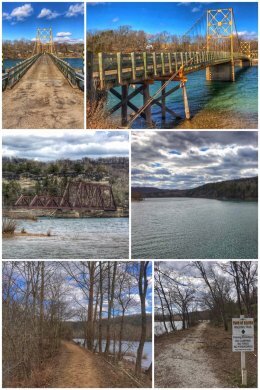 Our last spring in Arkansas was up to Eureka Springs, way north in the Ozark Plateau, near the state line with Missouri. 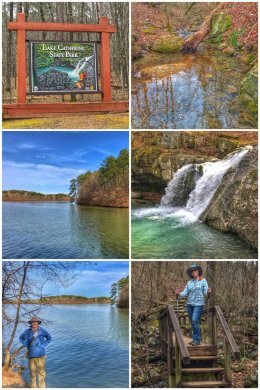 We arrived on a cold and rainy day (certainly a theme for our time in Arkansas), but happily the sun came out the next few days and allowed us to explore the area. The town fascinates us for many reasons. First, there are tons of lodges and motels, so obviously people like visiting. Second, lots of signs welcoming bikers, and we discovered it has several motorcycle rallies (including Bikes, Blues, and BBQ in late September and Heart of the Ozarks Rally in late May). Third, the town is cradled between two mountains of lush, hardwood forests. Fourth, the old downtown has incredible Victorian architecture, as well as lots of arts, antiques, and other shops and restaurants. On either side of town, you can also find a winery… and we visited both. We have discovered that most Arkansas wines are a bit too sweet for us, but we love visiting as many wineries as we can — supporting these local businesses. Keel’s Creek Winery is on the east side of town — and located less than a mile from our campground, so we walked there to do our tasting. The tasting was fine and the wines ok, but we don’t enjoy tasting where we have to follow what’s on the “tasting menu” rather than choosing the wines we want to sample. There’s a modest fee to sample — and you get a souvenir wine glass… plus, you can wander around a small art gallery that is part of the tasting room. 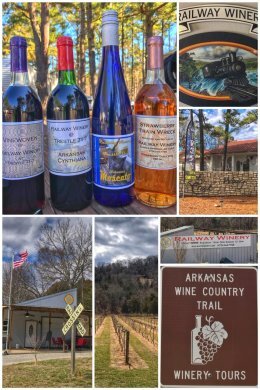 We had much more fun at Railway Winery and Vineyards for a variety of reasons, the first of which is the name and that is is actually located right on the old right-of-way of the Missouri and Northern Arkansas Railroad. (We love trains, rail-trails, and really almost everything train-related.) It is a small farm winery owned and operated by Greg and Vicki Schneider. Greg poured for us and shared sad stories of horrible flooding at the vineyard, but also of his plans to start a distillery at the vineyard. We tasted all their wines and left with four bottles: one each of Arkansas Cynthiana, Moscato, Strawberry Trainwreck, and Vinewoven. We also received complimentary wines glasses with a full tasting — and we definitely plan to keep these glasses! After visiting the winery, we headed into the little town of Beaver, located about 8 miles north of Eureka Springs, wanting to see more of the historic one-lane suspension bridge (built in 1949) along Arkansas Highway 187 over the White River at Table Rock Lake — the only suspension bridge still in use in the state, and referred to by some as the Golden Gate Bridge of the Ozarks. While in town, we decided to walk along the Beaver Walking Trail, a short hiking trail along the old M&NA rail line. Beaver also offers a small campground right along the lake/river, including one RV site right on the old railway line! From Beaver, we decided to take a quick trip up (unofficially) into Missouri to visit and hike in the Roaring River State Park, which is only located about 20 miles north of Eureka Springs. The 4,294-acre Roaring River State Park, established in 1928, is a public recreation area that offers camping, lodging, swimming, picnicking, fishing, and hiking — and includes several buildings and facilities built by the CCC. We learned that the CCC actually helped develop more than 800 state parks around the country. Camp Smokey, which was built the CCC, today serves as the park’s group camp. The park includes a bronze statue of a CCC worker, a tribute to the contributions made by these young workers. 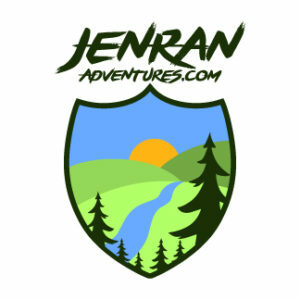 The park includes 7 trails that total more than 10 miles, so we started our visit at the seasonally open Ozark Chinquapin Nature Center to seek advice on the best trails to hike. As per our usual modus operandi, we decided on a hybrid approach, starting with hiking the Fire Tower Trail — a 3.75 mile loop trail that starts directly behind the Nature Center (which was also once the CCC -built bathhouse for the park). We decided not to hike the entire loop, but hike to the fire lookout (which you can climb) and then circle back down via a connector trail to the Deer Leap Trail (a short, .2-mile that offers an overlook above the fish hatchery and spring) to the River Trail (about .7 miles)… for a total of about 4.4 miles of beautiful hiking in the forest and along the river. 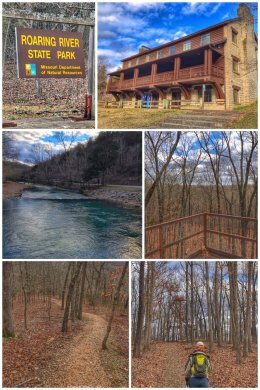 We moved on to Plan B, which started with a hike to Magnolia Falls, also located in the Upper Buffalo Wilderness, but supposedly one of the “best kept secrets” of the Buffalo River area. There are no signs except for a small Wilderness Access sign located on County Road 6 (also known as Forest Road 1462). The trailhead is directly across from the sign and the trail initially follows an old jeep trail. Keep following the trail until you cross a creek; right after crossing, the trail to the falls splits to the left. Follow the creek down to the falls, partly along an old stone wall and massive boulders. Once you get to the 26-foot tall Magnolia Falls, you can walk all around and above the falls — and even hike to a rock plateau downstream from which you can peer over the top of the 30-foot Woods Boys Falls. The 2-mile hike is all downhill getting to the falls and uphill coming back, but not overly strenuous. Because of all the rain, parts of the trail was muddy and we were quite happy to have our hiking boots. We ended our day with Plan C, deciding to hike a bit in Smith Creek Preserve, just off Highway 21 (about 13 miles southeast of Kingston), a 1,316-acre area of beautiful Ozark forest bisected by Smith Creek, a tributary to the Buffalo National River, and protected by The Nature Conservancy, a nonprofit environmental organization whose mission is to “conserve the lands and waters on which all life depends.” The preserve serves as an additional connection between the Ozark National Forest and the Buffalo National River Wilderness Area — and protects the location where the largest colony of Indiana bats in the state hibernates each winter…. the land is also home to gray bats, turkeys, black bears, and elk. Smith Creek Preserve offers multiple hiking opportunities, including a main trail that runs through the entire preserve, with a lower and upper trail offering loop options — with lengths of up to about 6 miles. We hiked the 1.5-mile (RT) trail to Elise Falls, a 21-foot high waterfall that tumbles through a slot in the rocks in the bluff line. As you can see in the photos, the water near the falls is a very cool shade of green. One note: the hike to the falls is all downhill. 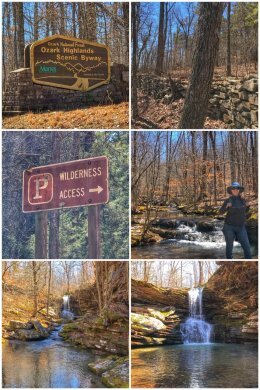 All-in-all, we loved our romping/springing through Arkansas — especially in the western and northern parts of the state, as we love mountains and forests and waterfalls. The state truly is beautiful, but we just wish they had more organic food in their grocery stores and/or more organic grocery stores… and a few Costco outlets would not hurt either! The people are friendly and the state parks wonderful… and the landscapes gorgeous. Next up, we officially head into Missouri.